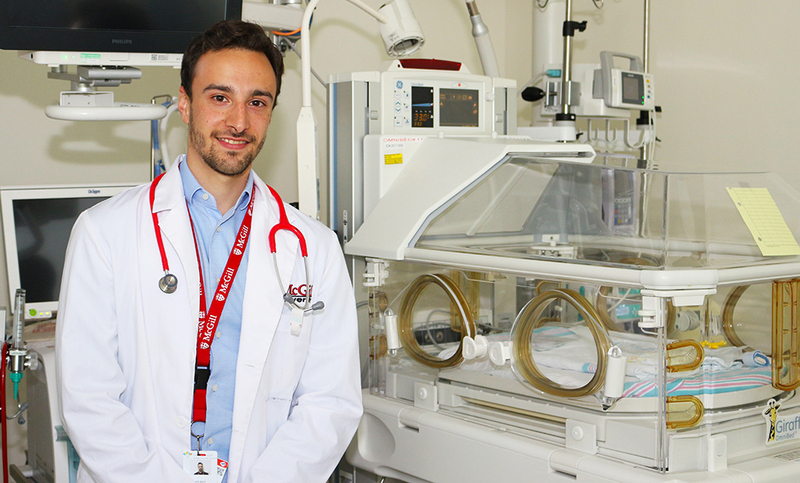 Angelo Rizzolo, a McGill University medical student, was born prematurely and received care in the JGH Neonatal Intensive Care Unit. Several years ago, Dr. Lajos Kovacs, a neonatologist, was making his rounds in the JGH Neonatal Intensive Care Unit, when he happened to notice an anxious-looking mother on the other side of the room. She was peering at her baby, who was fast asleep and seemed to be in stable condition. But because of his delicate condition, the prematurely born infant was in an incubator and connected to a ventilator. Instinctively, Dr. Kovacs understood the woman’s nervousness and made his way toward her, trailed by a high school student who was shadowing him for the day. A gentle smile crossed the woman’s face and the sparkle returned to her eyes, comforted that a baby in distress could grow up to be healthy and strong. In 2016, at a JGH reunion of former preemies, Angelo Rizzolo was congratulated by Dr. Apostolos Papageorgiou on his decision to become a doctor. As it turned out, Dr. Kovacs was right about the teenager at his side. Today Angelo Rizzolo is 24 years old, in his third year of medical school at McGill University, and expecting to graduate in 2020. Through it all, his memory of the incident with the mother and Dr. Kovacs has stayed with him. “It was rewarding to see simply by being present, I could have a positive impact on someone—that I could make a difference,” he says. 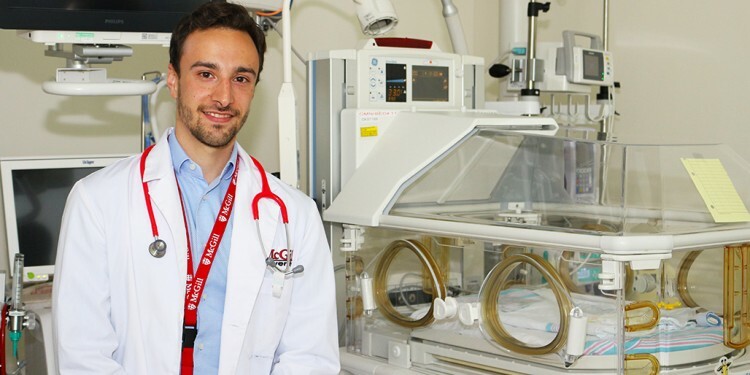 Mr. Rizzolo has always had a keen interest in pediatrics and neonatology, since he looks up to his role models, Dr. Kovacs and Dr. Apostolos Papageorgiou, JGH Chief of Pediatrics and Neonatology, who cared for him 24 years ago. However, he remains open to gaining experience in every medical specialty as he continues his training. 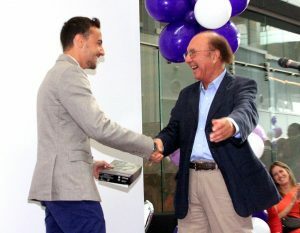 It was in August 2016, at a JGH reunion of former preemies who had “graduated” from the NICU, that Dr. Papageorgiou presented Mr. Rizzolo with a neonatal stethoscope to congratulate him on his decision to become a doctor and to encourage him in his studies. Mr. Rizzolo and his family have maintained close ties to the NICU over the years. In 1999, in appreciation for the NICU’s work and to help support the unit, they joined with the JGH Foundation to establish the Vivo Fund. Its motto is “Giving fragile infants the chance of a lifetime”, and it takes its name from the Latin phrase “in vivo”, referring to the analysis of cells or tissues “within the living”. By August 2018, the Vivo Fund had raised more than $100,000 through events such as a fashion show and jazz performances. It was Mr. Rizzolo’s involvement with the fund as a teenager that made him realize he could contribute to neonatology not only through fundraising, but as a clinician. “That’s where my initial passion for medicine came from,” he says, adding that he went on to complete an undergraduate degree in physiology from McGill, before applying to medical school. Now that he’s back at the JGH (based on random rotation placements), he’s taking advantage of this opportunity to get involved with The JGH Auxiliary’s Tiny Miracle Fund, which provides vital equipment for the NICU. Mr. Rizzolo is particularly interested in the Books for Babies Program, part of the Tiny Miracle Fund, which is supported by The JGH Auxiliary. It provides parents with a new children’s book to take home after their child is discharged from the NICU. 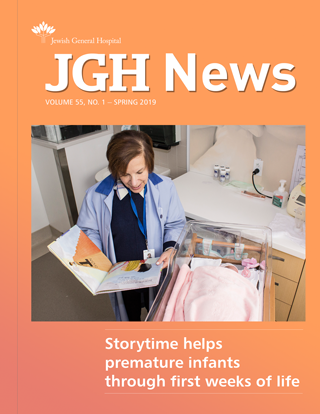 The doctor-in-training also hopes to take this program a step further by providing multiple books for each baby—including books for babies born at full term—to promote early childhood literacy. In the near future, in collaboration with the Tiny Miracle Fund, Mr. Rizzolo would also like to bring together a committee of former preemies to serve as volunteers and to give back to current families in the NICU. “My goal is for the committee to strive to improve the lives of families who are going through this very difficult time, and to pay it forward by giving infants the same chance we were given,” he says. Mr. Rizzolo expects to begin his residency in 2020 and, with luck, once he has graduated, he may even launch his career in the hospital where he was born.